Most days, Tim Anderson's performance would have made him the star. Matt Davidson showed up his Chicago White Sox teammate. 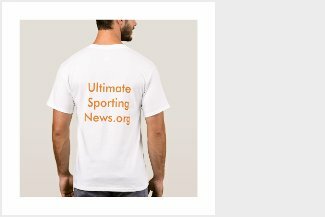 The young designated hitter became the fourth player in major league history to homer three times on opening day , while Anderson had to settle for just two of Chicago's six home runs , and the White Sox pounded the Kansas City Royals 14-7 on Thursday to spoil their 50th anniversary celebration. "I just couldn't catch him," Anderson said with a smile. Jose Abreu also went deep for the White Sox, who picked up James Shields (1-0) in a big way after the former Royals ace surrendered four runs in the first inning. Shields wound up lasting six innings, holding Kansas City without a hit after that shaky first. Yolmer Sanchez added a three-run single and Yoan Moncada drove in a pair of runs for the White Sox, who forced Royals manager Ned Yost to burn through nine pitchers. "The boys did an unbelievable job hitting today. It was amazing to watch," Shields said. "I told them, `You don't see that many home runs at Kauffman Stadium this early in the year.'" Danny Duffy (0-1) breezed through three innings for Kansas City, but a trio of homers in a five-run fourth ruined his day. The left-hander survived the inning before hitting the clubhouse. "I think they were heater-hunting," Duffy said. "One inning, I gave up three homers. Not ideal." Despite a cold rain and steel-gray skies, the Royals looked early on as if they would reward the hardy fans who turned out to celebrate the start of their golden anniversary season. Longtime third baseman Mike Moustakas, who signed a one-year deal during spring training, provided an RBI single in the first before new first baseman Lucas Duda hit a three-run homer to right. Everything unraveled when the fourth inning began. Abreu led off a homer binge with a two-run shot , Davidson followed with his first home run , and Anderson added his first two batters later . By the time Moncada added an RBI double off Duffy later in the fourth inning, Chicago had turned a four-run hole into a 5-4 advantage. "We did the same thing to Shields that they did to Danny in the fourth. We jumped him early," Yost said. "He was making pitches we could drive and after the first inning really just reeled it back in and pitched a great game." Davidson and Anderson went deep again in the fifth off Royals reliever Blaine Boyer, and Sanchez tacked on a bases-clearing single off Burch Smith with two outs in the seventh. 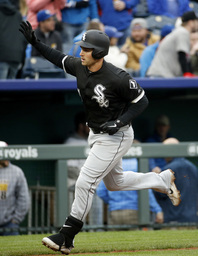 Davidson capped his big game with a three-run homer off Brian Flynn in the eighth , becoming the first White Sox player with a three-homer game since Dan Johnson in October 2012. "Special day in anybody's book," White Sox manager Rick Renteria said. "Just in general, I thought it was a nice start. We fell behind early and that seemed to matter not to any of the guys." Davidson and Anderson are the eighth set of teammates with multi-homer days on opening day. The previous was Toronto's Shannon Stewart and Tony Batista on April 3, 2000, against Kansas City. ... The only other White Sox players to have multihomer games on opening day are Alejandro De Aza (2014), Jim Thome (2008), Sammy Sosa (1991) and Minnie Minoso (1960). ... The others to homer three times on opening day were Detroit's Dmitri Young (2005), the Cubs' Tuffy Rhodes (1994) and Toronto's George Bell (1988). Royals: C Salvador Perez (left knee sprain), RHP Nate Karns (right elbow inflammation), INF Adalberto Mondesi (right shoulder impingement) and OF Bubba Starling (left oblique strain) were placed on the DL before the game. Perez is expected to miss 4-6 weeks, though Karns could be back soon. White Sox: Hard-throwing LHP Carlos Rodon (left shoulder rehab) and C Kevan Smith (sprained left ankle) were placed on the DL retroactive to Monday. The Royals also designated for assignment pitchers Wily Peralta and Ryan Zimmer, selected the contracts of INF Ryan Goins and RHP Blaine Boyer and recalled C Cam Gallagher from Triple-A Omaha. The White Sox selected the contract of LHP Hector Santiago. The teams are off Friday before resuming their series this weekend. The White Sox will send RHP Lucas Giolito the mound Saturday night while the Royals counter with RHP Ian Kennedy.